If beer, food and football, or just beer and food, is your thing you’ll be pleased to know that the Northern Quarter’s Tib Street Tavern has launched a food menu! The traditional-style pub is serving up traditional pub grub with quality. The menu is a ‘mini’ one for the moment and it serves as a small taster for things to come when the full menu is launched. 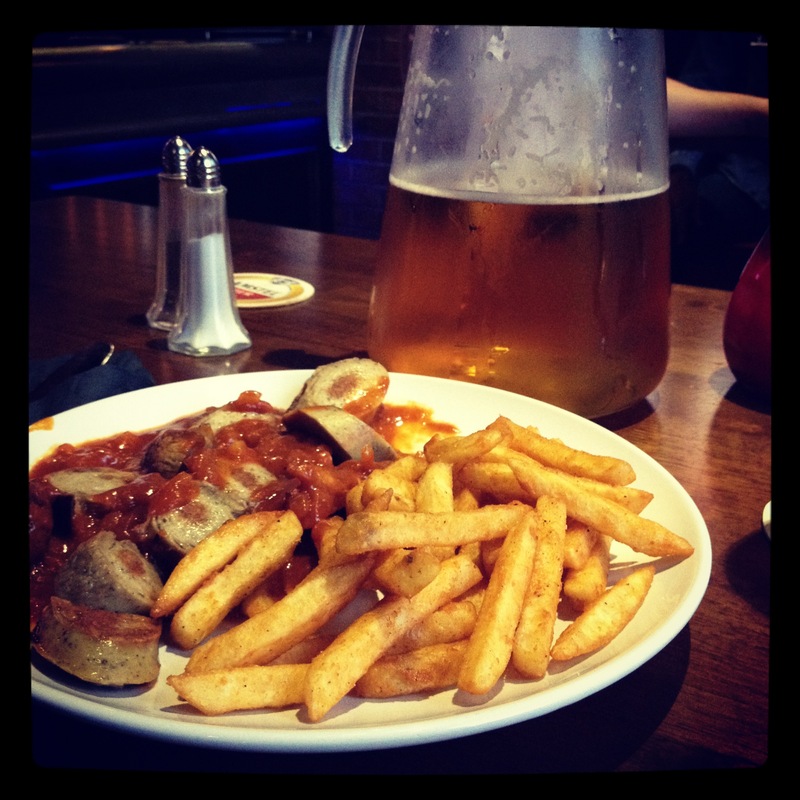 We opted to share the Currywurst sausage with chips and home made sauce, it was definitely the pub-grub that we needed! With the food at a very reasonable price, it provides the perfect amount satisfaction and sustenance to get your started on the pitchers of beer. The chips were great and seasoned really nicely (my partner enjoyed them and he’s definitely a chip man! The sausage was yummy and the homemade sauce was a tangy, tomato and onion mix with a hint of spices – really good! 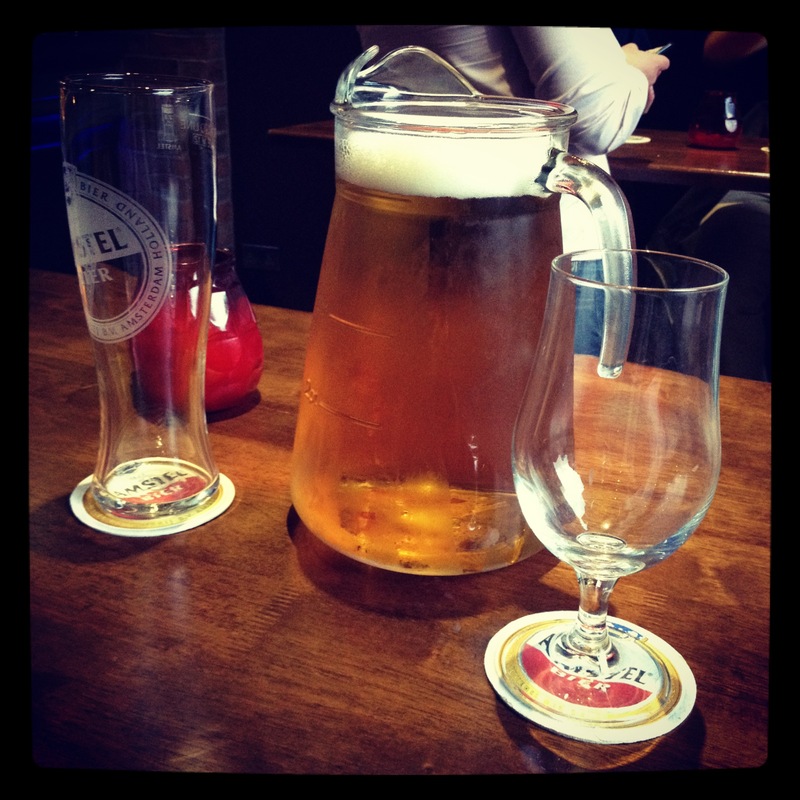 You’ll also be pleased to know that a four-pint pitcher of Amstel is only £10 from 3pm-7pm, and only £12 afterwards, so you don’t have to keep going to the bar if the match is on – perfect! Although Tib Street Tavern shows football it doesn’t allow football colours to be worn. Odd at first but it actually makes for a really friendly vibe, especially if you’re not there to watch the game. 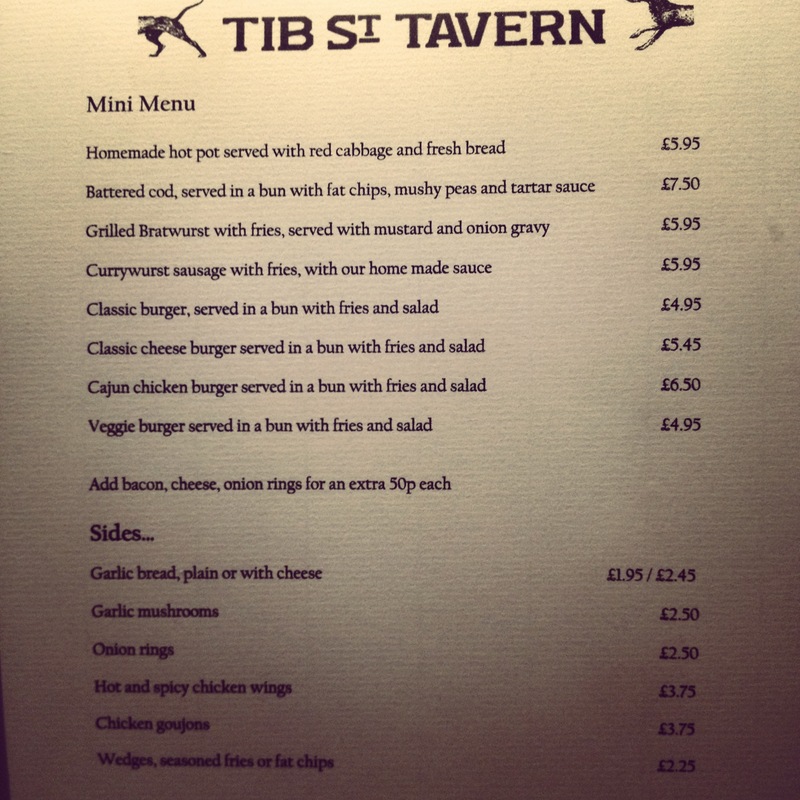 We’ve always experienced great service at Tib Street Tavern and our last visit was no different with table service being provided if we were running low and a complimentary peanut mix for all tables as the hours grew wee. It’s the little things which make a bar great. I’ve been meaning to blog about this place for a while as it has quickly become a favourite of mine. It’s unassuming and low-key and although it won’t excite everyone it has a charm about it which will always keep me going back. The first time I visited, the bar was super busy, and my three friends and I wanted cocktails so we asked to see a cocktail menu. Instead of saying that they didn’t have a cocktail menu, the really lovely girls behind the bar said that the cocktail menu hadn’t quite been finalised yet but they were more than willing to make us some of the classics (margarita, cosmopolitan etc). We ordered some cocktails and they were fantastic, if a little impromptu! Since then, we were hooked and it set us up for a great night! Great service, with a (genuine) smile, great drinks offers, a new menu and an even newer one in the pipeline… what’s not to like? Get down and try it out!